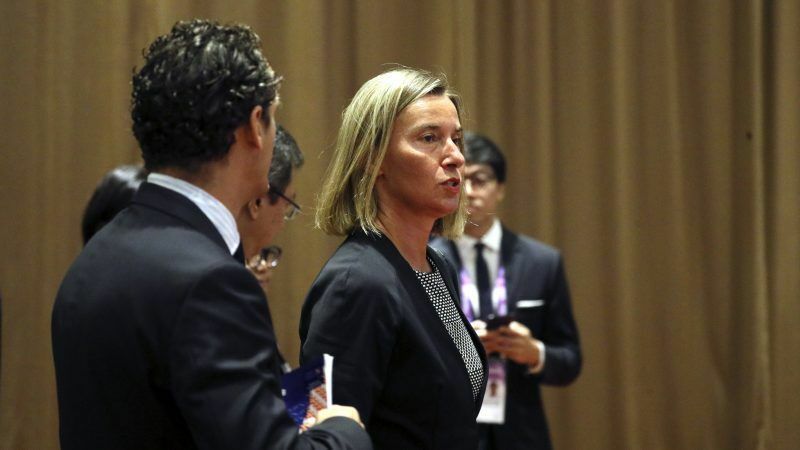 During a roundtrip of Asia this week, EU foreign policy chief Federica Mogherini will seek support to preserve the Iran nuclear deal, as well as exploring security cooperation in order to expand engagement and up the EU’s role in global security, writes Fraser Cameron. Fraser Cameron is director of the EU Asia Centre. While others may be basking on the beach, Federica Mogherini, the EU’s tireless foreign policy chief, jets off to visit several Asian countries this week. Although she has had to spend huge amounts of time trying to save the Iran nuclear deal, Mogherini understands how important Asia is for European prosperity. The Asia-Pacific bloc is the EU’s biggest trade partner, with some €1.5 trillion in two-way trade in 2017 and over €800 billion of European FDI going to Asia in 2016. All projects show that these figures are likely to increase in coming years. If the EU interest is clear, Mogherini’s visit also reflects a growing Asian interest in strengthening ties with the EU which is now viewed as a stable and predictable actor, compared to the uncertainty that characterises the US under Trump. The constant refrain from all Asian leaders in recent months is that they do not wish to see the current rules-based international system destroyed. Hedging is now the name of the game. Asian leaders can no longer rely exclusively on Uncle Sam and they do not wish to fall under the Chinese steamroller. There is thus a new found enthusiasm for the EU as the principal defender of a rules-based order. This was most marked in the recent signing of the EU-Japan FTA. Prime Minister Abe, despite his multiple golf rounds with Trump, has concluded that it might not be sensible to place all his eggs in the American basket and it is time to deepen relations with the largest trade bloc in the world. The economic and trade agreement was complemented by a wide-ranging political agreement that should lead to closer foreign policy cooperation between the EU and Japan. The Japan deal followed a remarkably positive summit in Beijing where both sides agreed on the importance of deepening their already comprehensive relationship. Remarkably, the EU and China are more on the same page when it comes to Iran, climate change and preserving the UN system than with the US. President Xi, who has recently cemented his power base in China, also views the EU as a solid anchor in an uncertain world. There are of course areas of dispute such as human rights between Brussels and Beijing and it remains to be seen how China’s highly ambitious Belt and Road Initiative can be linked to the EU’s forthcoming policy on enhancing connectivity between Europe and Asia. Mogherini will have an opportunity to build on the momentum created by the recent summits by visiting Korea (the first Asian partner to sign an FTA with the EU) to demonstrate the EU’s support for the tricky negotiations to denuclearise the Korean peninsula. Brussels and Seoul increasingly agree on big foreign policy issues and Mogherini will seek further opportunities for both parties to work together. She will also visit Australia and New Zealand with whom the EU has just launched FTA negotiations. Both countries fall squarely into the like-minded camp and Mogherini will again push for a de facto coalition to preserve the rules-based, multilateral system. Given the unpredictability in Washington, Canberra and Wellington are also engaged in a major debate about their future security. They too view the EU as a stable partner in a turbulent world. Mogherini will also take part in the ASEAN Regional Forum (ARF) in Singapore, the annual gathering of the SE Asia grouping with its partners to discuss security issues. Despite its many internal problems, the EU is keen to promote the centrality of ASEAN, with its commitment to multilateralism, international rules and its culture of consultation and inclusiveness. It believes that its own experiences in resolving disputes could be useful in reducing tensions in the South China Sea and elsewhere. In May, EU foreign ministers agreed to enhance the EU’s security cooperation with Asia though intensified consultations, capacity building, training programmes and joint exercises. The EU is already working with ASEAN on sensitive issues of maritime security, cyber security and the prevention of violent extremism. Now the plan is to expand on this engagement. During her tour, Mogherini will present the EU as a reliable partner that can make an important contribution to resolving security disputes. She cannot promise EU aircraft carriers sailing through the Taiwan Straits but many if not most of today’s security issues can be mitigated if not resolved through soft security measures which is the EU’s strength. These can include various confidence building and capacity building measures covering conflict resolution and peacekeeping (the EU has already engaged successfully in Aceh, Indonesia), counter terrorism, police and coastguard training, combatting illegal fishing, military to military contacts, and anti-piracy (a number of Asian partners have already participated in the EU-led Operation Atalanta in the Red Sea). While seeking Asian support to preserve the Iran nuclear deal, Mogherini will also explore with partners cooperation in enforcing UN sanctions (DPRK being the top priority), assisting stabilisation in Afghanistan, the return of refugees to Myanmar, and working to establish new norms for space and cyber. It is encouraging that several Asian countries have already participated in EU CSDP operations. The EU also has an interest in engaging with Asia on common security challenges outside Asia, especially in/around Africa and the wider Middle East, given the EU’s interests and number of CSDP operations there. The reform of global governance structures, where Asians are under-represented, is another shared interest. Upping its role in Asia will not be easy. The Asian security landscape is shaped by a large number of factors: strategic competition between the big powers; historical grievances; ethnic and religious tensions; governance failures; competition for resources, territory and influence, all compounded by expanding defence spending and capabilities, including nuclear capable states. This volatile mix explains the EU’s vital interest in supporting overall stability in Asia and advancing a rules-based approach to promote effective security structures. If Mogherini can help achieve this, it will be an important part of her legacy.